The Albion Save Game Editor is an editor for the save files of the old game "Albion" (german review). 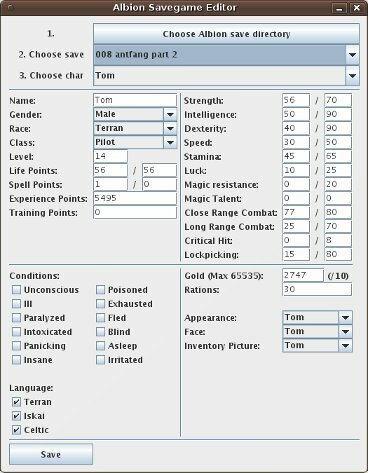 Thanks to the strukture of these files, Albion Save Game Editor can not only change common stuff like the amount of money you have, but also nice stuff like the character classes. The Albion Save Game Editor was only moderately tested. It automatically creates backups for the changed save files, but you should manually backup just to be sure. If the number is 1.6 or larger, Albion Save Game Editor should run. If you don't have Java or an old version, you can download the newest one at "Download". If everything works, you can just double-click the jar file, but sometimes a compressing software like WinZip graps this file extension. How do I save changes I made? I just found your editor and I find it great! Albion is a true underdog of the rpg genre and I am glad that someone has finally done something with it. Are you planning on expanding this editor? I am interested in seeing an inventory editor and a spell editor added to the program. That would make it complete in my opinion. I like Albion, but I think it's a bit too hard if you don't know it in and out. A normal player will probably miss out 50% of useful items and will not know when to buy what and level who (for example, on my first play, I diddn't level sira while still on the first isle, so I only got the avalanche spell late in the game and then it diddn't freeze most enemies so I diddn't level it and hardly ever used it. As you can guess, this made things a whole lot harder than they had to be). Including an inventory editor would require me to do a binary compare for every single item change to find the memory space for the item slots (of every character) and the values of the items - truly a buttload of work, so I doubt I'll ever do it. But - even thought there were no save game editor for albion when I made this, I since saw one once that included an inventory editor. I can't remember the name or where I saw it, but googling for "albion save game editor" would probably list it. I have a question. Since I tried to play Albion again, I searched for a save game editor and found yours. The positive thing is, that I can start the programm - the Albion Save Game Editor.jar, even though I use Vista 64bit. But when I start the programm and I want to open my save game, I can open the folder where the save games are saved, but then i can't find the savegame-files. I see nothing and therefore cannot open the savegame. Do I need the second file (the sourcecode thing)? And what do I do whith it? You don't need the sourcecode. That's just for people who want to know the programming behind it. Your savegames in that directory are then listed with their names beside "choose save"